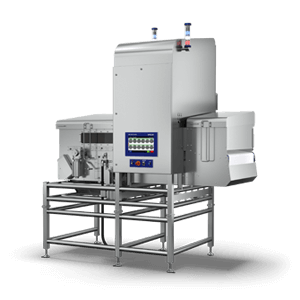 For Frozen-Formed Products The X39 X-ray System is specifically designed for the inspection of frozen-formed products, ensuring your products are free from contaminants and product defects. Simultaneously detects and rejects contaminants such as calcified bone, glass and metal within frozen formed products including burger patties. 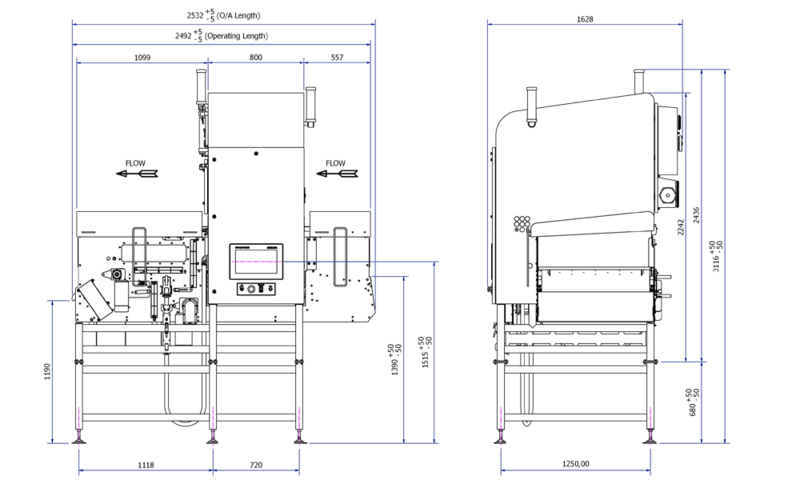 IP69 design ensures the demands of harsh environments are met, using 316 stainless steel for all key product contact areas including the reject flap. The X39 can inspect products at up to 57m per minute whilst a dual reject system ensures rejection of non-conforming product for re-work. The X39 simultaneously inspects products for mass, dents, holes, edge defects, flakes and product length, width and height, ensuring only conforming product is accepted before continuing the process. Fully integrated multi-air nozzle reject system and scoop device minimises product waste and saves costs. Capable of inspecting up to 1,800 products per minute, maintaining a high throughput rate without restriction from other equipment upstream/ downstream. Advanced software monitors all aspects of the system, warnings are made should the laser or reject nozzles loose accuracy, ensuring a continual flow of high quality product throughout the process. 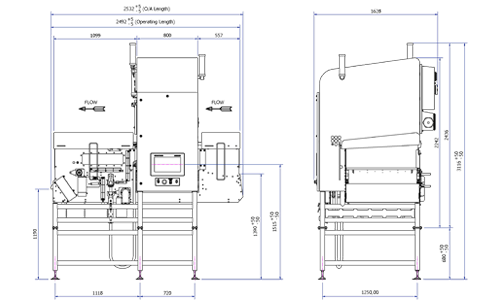 Ramped conveyor design with x-ray shielding shut down plates allow for the system to be completely curtain-less ensuring the product flow is undisturbed allowing for optimum inspection. The production belt runs in grooved rollers ensuring that the belt does not move and require customer intervention, increasing production uptime. This White Paper explains how bulk-flow product inspection equipment can help to protect consumers and minimize the risk of product recalls. Find out how the X33 Series of X-ray Inspection Systems is constructed in this animation.The revolutionary X33 series gives food and pharmaceutical manufacturers an increase in foreign body detection sensitivity whist requiring a fifth of the power of a traditional x-ray system. Developed with customers, the X33 Series X-ray Inspection systems are built upon the needs of our customers and have the power to boost productivity and reduce production costs. The X39 x-ray inspection system offers enhanced levels of physical contamination detection and product integrity verses alternative x-ray systems. METTLER TOLEDO Safeline X-ray generators previously came with 30 months' warranty, however, we are so confident in the reliability of our generators that we are extending this to five years for our X-Series systems, when purchased with a Standard or Comprehensive Care Contract. Bell installed an X39 x-ray inspection system on their burger patty manufacturing line in Oensingen, Switzerland in 2017 following increased customer demands in terms of quality assurance. The requirement to ensure all of their burger patties are contaminant free and meet the stringent product integrity requirements prompted Bell to contact Mettler-Toledo Safeline X-ray to discuss how they could help achieve these company objectives. Safeline X-ray's Standard and Comprehensive Service Care Package now exclusively includes a 5 Year Generator Warranty.